I will be the first to admit I am easily distracted. If I am cooking or baking I really have to focus. If I don’t then I end up – not so much anymore – with Black overly browned food. Needless to say when I saw the words Brown-Butter I was a little leery. I mean, BROWN butter. Not BLACK butter. Not OVERLY BROWNED butter. Just BROWN enough to give a nice nutty flavor. As Dorie admonished “….a fine line between brown butter and burned butter,…” So I stayed with it. Kept it on low heat and ended up with PERFECT Brown Butter to make this nice not too sweet cake. Besides the BROWN butter there is Vanilla Bean and Rum (if you wish) to flavor this cake which is the perfect foil for ice cream or whipped cream, or caramel sauce. We liked this nice little ‘weekend’ cake. I think I would add a smidgeon more rum next time and I wish I had had some vanilla beans. The vanilla extract was fine but not as flavorful as the bean. 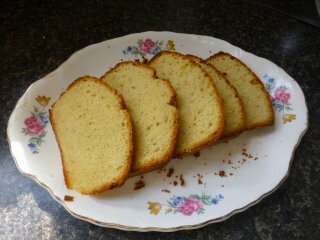 The recipe for this cake is on page 6 of Dorie’s baking chez moi, which you really need to have on your cookbook shelf. And for the rest of the Dorista’s cakes visit with them at Tuesdays with Dorie and see if they liked it as well. 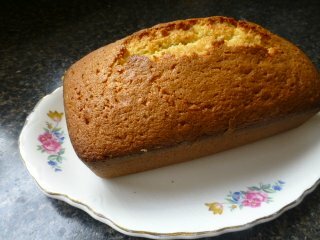 I really enjoyed this cake – so simple yet so good! Ah yes, that browned butter bit made a big difference, didn’t it? After having made the risotto last week for WWDH I figured I would grab another book and not walk away from the butter process…I am getting a lot of reading/cooking/baking done this past week! lol Delicious, and the fussy guy who does not like cake had TWO pieces in one evening. Enough said on that…and yours looks so pretty on that lovely plate. Antique plate from MIL. Perfect for this cake. Yeah, B liked it a lot, too. My Kindle-in-the-Kitchen works that way. I was relieved when I managed to brown the butter without any blunders! Your cake turns out lovely! I loved the flavors in this cake and the brown butter had me worried too. Fortunately, I didn’t burn it. Your cake looks perfect. Yes to a smidgen more rum (Plus the cook’s portion). Glad you survived the browned butter adventure 🙂 Looks delicious. I made this! yea me. But mine turned out a little flat in comparison to yours. It is quite delicious though! Yours is perfect, of course. Your cake looks perfect and I love the antique plate! I didn’t use rum at all and it was still delicious. Can’t wait to make it again with rum or amaretto. A perfectly beautiful cake!! Simple and wonderfully delicious! Glad you mastered brown butter—I love using it in all sorts of desserts! And your cake looks marvelous! Looks wonderful! I didn’t use rum but did use a vanilla bean and it had great flavour. Yes, I liked the run in the cake and I used some grade B vanilla beans (less moist) and then some homemade vanilla extract that flavored it perfectly. Your loaf cake turned out beautifully. Hahahaha. I liked the rum in the cake as well. Glad it went down greaat with your family. looks great. and I agree–brown butter cake is much more tasty than black butter cake! Looks wonderful! Mine had a bit too much rum! Yet, still pretty tasty. I’m always nervous when I’m browning butter, but the results are so amazing. I loved this little cake and it’s well worth using a vanilla bean for.